Father Christmas is getting his rest before Christmas preparations start at Kielder Water & Forest Park in Northumberland. With tickets to Kielder Winter Wonderland on sale from 10am on Thursday September 17, 2015, Santa was caught making the most of the last of his holidays. For the last eleven years, his festive extravaganza, which sees Northumbrian Water’s Leaplish Waterside Park transformed into an enchanted Winter Wonderland, has been a sell-out with families across the country. The Christmas experience is one of the best tourism events in England and scooped silver for Best Tourism Event of the Year at the VisitEngland Awards for Excellence in May. While his elves were busy in the workshop at the North Pole, Santa Claus managed to sneak in the much-needed break at the weekend, but he’ll be bringing all of his friends with him for some festive fun when he arrives at Kielder in November. Visitors will be able to help the elves in their Kielder workshop, enjoy the Christmas Theatre shows and discover Mrs Christmas and her friends before meeting the main man himself. For the first time, families will also be able to meet and feed Santa’s real reindeer, who will be resting at Kielder before their big night. The magical, day-long event, which is organised in partnership with Dodgy Clutch Theatre Company, is full of activities and surprises for the whole family. Attracting more than 20,000 visitors over a 14 day period, Kielder Winter Wonderland makes a huge impact on the rural tourism of Northumberland where local businesses can benefit from the extra trade outside of peak season. 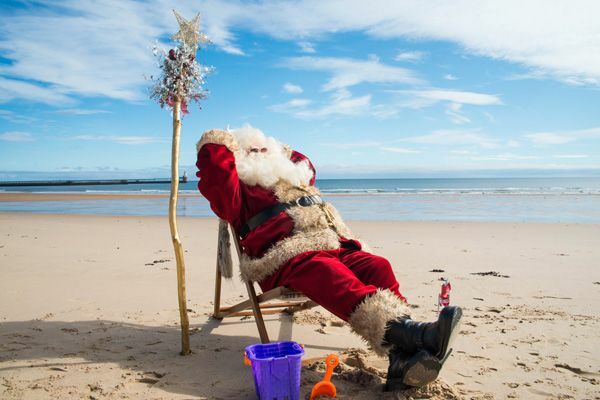 David Hall, Head of Leisure Strategy & Transformation at Northumbrian Water, said: “It’s just as well Father Christmas has taken a break, he’s got a busy time coming up. “He brings his friends and helps us to put on an amazing, award-winning event year after year. Not only does it delight thousands of children but it’s so important to the county’s local visitor economy. The event will run every weekend from Saturday November 21, until Sunday December 20 and includes Friday December 18, Monday December 21, and Tuesday December 22. The whole family will get gifts to take home from their day, plus the chance to take part in skating, snow tubing and a visit to Snowy Owl and friends at the Birds of Prey Centre. Tickets can be booked online at www.kielderwinterwonderland.com or by calling 0845 155 1553. To book a Kielder lodge and Winter Wonderland tickets together, call 0845 155 1553 from 10am to 5pm, Monday to Friday. Group bookings of 12 persons or more should also be booked by telephone.